Essential Eames: A Herman Miller Exhibition will open at the Marina Bay Sands ArtScience Museum from 29th Jun 2013 till 5th Jan 2014. Based on An Eames Primer by Eames Demetrios, the exhibition traces the lives and works of the most famous couple in design – Charles and Ray Eames. Co-presented by ArtScience Museum and Herman Miller in collaboration with the Eames Office, Essential Eames will showcase 100 pieces of rare and never-before-seen works and images from the Eames’ family collection, The Eames Office, and Herman Miller archives. 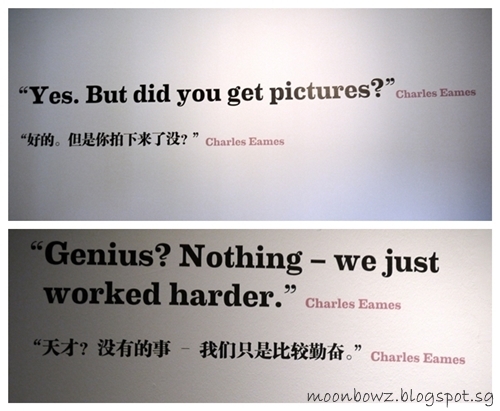 I was invited to the media preview of Marina Bay Sands ArtScience Museum’s latest exhibition, Essential Eames: A Herman Miller Exhibition. This will probably be an furniture exhibition which showcase the creation of Charles and Ray Eames. Interesting quotes spotted at the ceiling at the entrance! It’s not about the furniture, it’s about life, Charles and Ray Eames’ life. Interesting quotes – simple. direct. humble. Can you see the markings? Those are indicators on which part of the chair to work on. I will strongly recommend you to attend this coming weekend’s exhibition so you can catch Mr. Eames Demetrios’ guided tour – I feel that I learnt and see a lot more with his guided tour. Mr. Eames Demetrios will be leading visitors through the exhibition, revealing fascinating fact about the life and design philosophy of his grandparents – Charles and Ray Eames. Mr. Eames Demetrios will be talking about the Eames design philosophy, learning design backwards, and the treasures brought specially to Singapore. 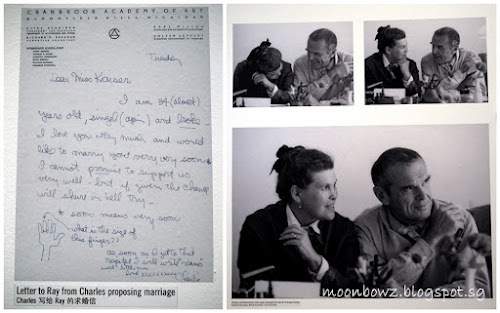 Charles and Ray Eames use different materials in their creation to help change how people see, feel, touch and experience things in their daily lives. Visitor can collect the rubbings of six different materials in the galleries. Visitors can create their own small-scale furniture piece to take home. 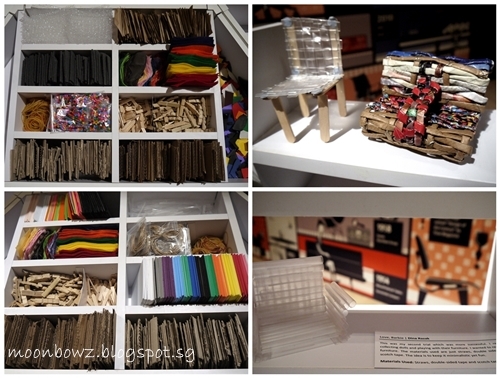 This activities will provide participants with the opportunity to utilised many of the materials on display in the exhibition and explore their own creativities in the process. 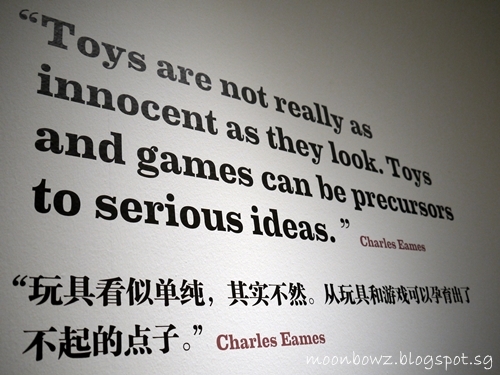 In the spirit of Charles and Ray Eames’ love of play and character. Visitors can decorate their own character mask to bring home.